Swedish music streaming service Spotify on Wednesday released an update to its iPhone and iPad apps that officially enables new subscription-free streaming features the company promised last month. Users accessing the Spotify service on their iPhone can now stream any artist's entire catalog without a paid subscription, though playback is restricted to shuffle mode on Apple's handsets. 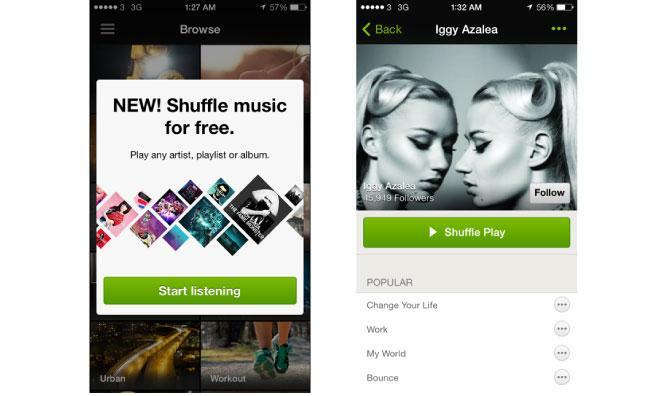 Both user-created and Spotify-curated playlists can also be streamed at no cost with the same shuffle-only restriction. Those using the service's iPad app, however, are not subject to the same limitations. The update allows tablet owners to stream any song at any time, though audio advertisements will still be present. Spotify previously required mobile users to have a paid subscription as a condition of its licensing agreements with music labels. Word that the company was seeking to eliminate that constraint surfaced last February, and the new plans were officially announced in December. Increasing pressure from established competitors like Pandora and new threats such as Apple's iTunes Radio, which offers ad-supported streaming for free on most Apple devices, is believed to have been the catalyst behind Spotify's decision. Despite its popularity, the service continues to hemorrhage money and was forced to seek $200 million in new venture financing last November. Spotify version 0.9.2 is available now as a free, 35.4-megabyte download from the App Store.